A little more than eight years ago the owners of advertising vehicles brought a fresh idea to the advertising table in the Midwest. Vehicle wraps allow companies the opportunity to utilize the fleet of vehicles they already have to promote their company with full, colorful, bold graphics. The idea raised many questions from the consumers such as why use vehicles to advertise my company and its products? The answer seemed obvious, the images on the vehicle(s) reflect a winning attitude and drive customers through the door in a cost effective manner. A company vehicle is an asset so why not use it as a rent free billboard? At present, Advertising Vehicles has wrapped thousands of vehicles from compact cars to 53’ trailers. Visit www.advertisingvehicles.com for a full complement of photos. Similar to Advertising Vehicles eight years ago, Advertising Trucks begs the question “why advertise on box and semi trucks?” The simple concept behind Advertising Trucks takes vehicle graphics a step further by allowing you to change the colorful, bold graphics as often as necessary; perfect for companies with several different products or promotions. By limiting trucks to a simple brand logo companies are losing the opportunity to utilize the marketing space to its full potential. With the Traxx Truck Advertising System companies can embrace the idea that their trucks are literally billboards on wheels and for the first time ever, the fleet becomes part of the media marketing plan. The return on investment when using a vehicle that the company owns and uses on a daily basis will be greater than any other marketing campaign due to the millions of impressions the trucks will create while driving their regular routes. 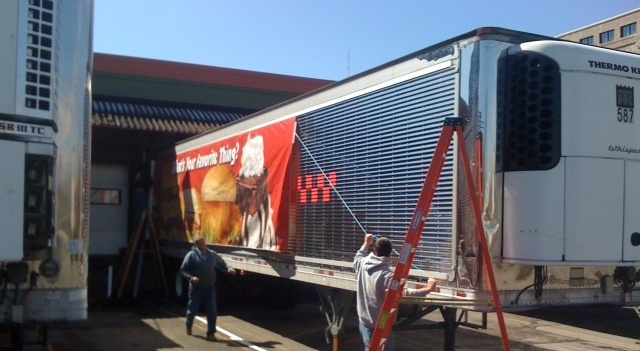 With over 8,000 trucks in operation today utilizing the Traxx Framing System, it’s only a matter of time before the value is realized and tens of thousands of trucks are using this changeable truck advertising system.